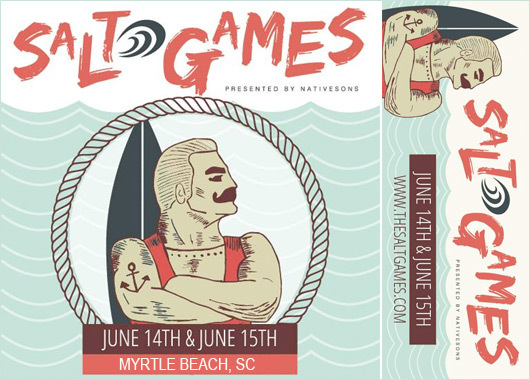 June 14-15, 2014 | Myrtle Beach — This year's June Calendar of SC Events is brought to you by Salt Games, a celebration of life on the Grand Strand featuring beach games, races, contests, and live entertainment. Proceeds go to the Surfrider Foundation of the Grand Strand, a volunteer organization that seeks to protect the ocean and its inhabitants via education and hands-on engagement. In addition to SCIWAY's June Calendar of SC Events, remember that all of our event calendars, for every month of the year, are always available on our website – just go to https://www.sciway.net/calendar.html. You can sort events by date, city, name, or type – it is hands down the best South Carolina calendar anywhere! On Saturday, June 28, our state will celebrate Carolina Day, the 238th anniversary of Colonel William Moultrie's stunning Revolutionary War victory over the British at Fort Sullivan – now known as Fort Moultrie. Not only was this battle an important victory for our colony and our country, it was also the source of South Carolina's unique and beloved state flag. Prior to the battle, Moultrie had been assigned the task of designing a signal flag for the South Carolina militia. The Council of Safety is said to have provided the colonel with cloth for the flag in the indigo color of the militia's uniforms; Moultrie then placed on the cloth the same crescent that was used as an emblem on the uniforms' caps. There remains speculation as to why the caps included the prominent crescent, but a commonly-accepted theory is that the crescents were representative of gorgets, or metal military neck protectors worn during medieval times and adopted as a military symbol during the rule of King George II. 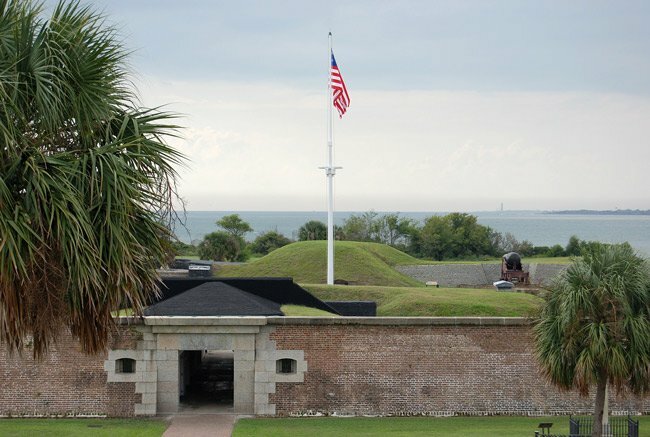 The June 28, 1776 triumph at Fort Moultrie was largely credited to the ability of the palmetto tree fort to absorb and thus negate the force of British cannonballs. 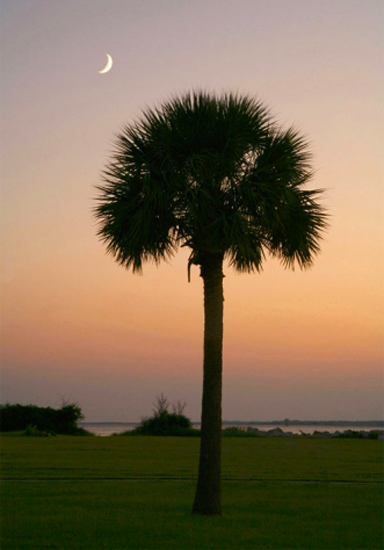 Afterwards, the palmetto became a venerated symbol of liberty in South Carolina. 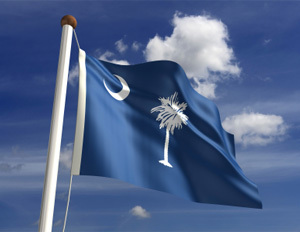 The palmetto tree was included on the South Carolina state seal in 1777 and added to the state flag in 1860 when the state was charged with designing its own "national flag" after seceding from the Union. 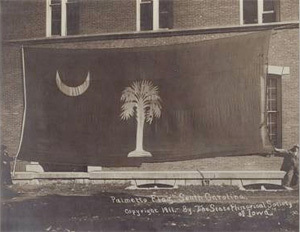 The flag design has remained intact since then and is a symbol of pride for many South Carolinians. 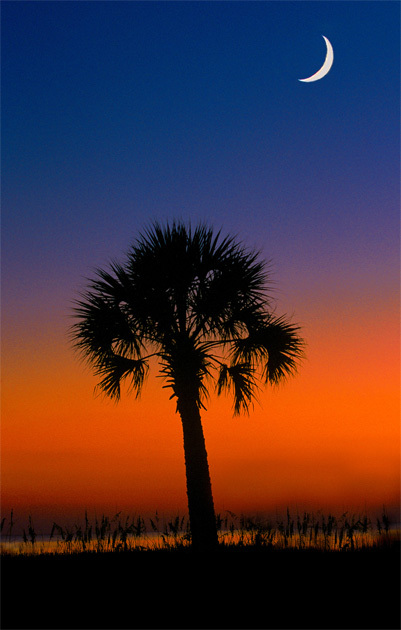 Though many people regard the tree as primarily ornamental, palmettos were essential to the Carolina Day victory. As a consequence, they have earned a place in both the history of South Carolina and the history of the United States. Today, Moultrie's flag is one of the two most widely recognized state flags in the nation – along with the Lone Star of Texas – and it can be seen gracing homes, clothing, cars, jewelry, and more. 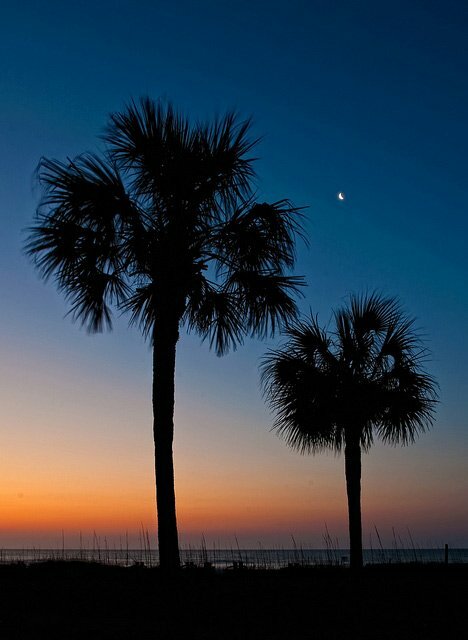 Even South Carolina's nickname is the Palmetto State!